For Government or non-Government employee, uncommuted pension is fully taxable. 1. Commuted pension received by employee of local authority, Government organisation or statutory corporation under Civil Pensions (Commutation) rules of the Central Government or under any other similar scheme is wholly exempted from tax as per Section 10(10A)(i). Also in following cases pension is exempted from Tax. Family pension received by family members of armed forces. Employee doesn’t receive Gratuity: Commuted value of one-half of such pension is exempt from tax. 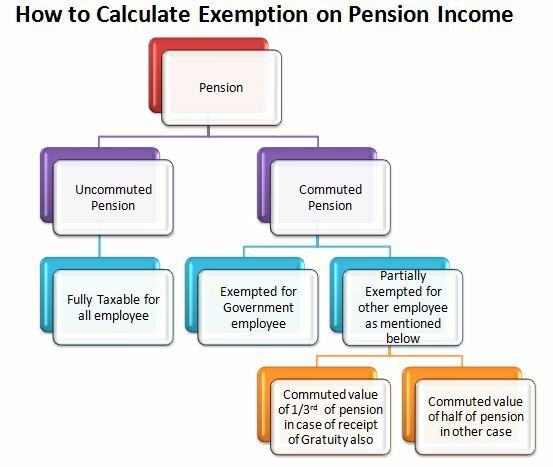 When pension amount received by employee exceed exemption limit as mentioned above, such exceed amount is liable to tax when it is due or paid. Family pension received by family members of employee is taxable in the hands of recipients under head “Income from other Sources “and not under head “Income from Salary”. ‹ Why Should I buy term insurance? I am retired from Indian Air Force and in receipt of service pension. Is the income from this pension is exumpted from Income Tax ? 1. Commuted pension received by employee of local authority, Government organisation or statutory corporation under Civil Pensions (Commutation) rules of the Central Government or under any other similar scheme is wholly exempted from tax as per Section 10(10A)(i). My Father was a government servant and after his death my Mother gets family pension , she is not a senior citizen yet. We don’t have any other income other than Family Pension . My mother gets Rs.23000 as a family pension ; will she still have to pay the tax ? and she has some Fixed Deposits in the bank too , are they also taxable ? I was a Govt College Principal, retired on 31.12.2015. Out of which Rs 14,356.00 is deducted as commuted + Rs. 5,298.00 deducted as Income tax. Finally, a Total of Rs. 59,446.00 is deposited in my Bank Account every month. Kindly explain whether the Pension amount Rs. 35,890 or Rs. 21,534 (35,890.00-14356.00) will be added together to arrive at the Taxable income along with DR & Medical Allowances? And what will be my Pesion after 7th Pay Commission. Dr. B.K.Nath, Retired Principal, Guwahati, Assam. Out of which Rs.9,167 is deducted as less commuted value. whether Rs. 9,167 will come under income tax deduction?